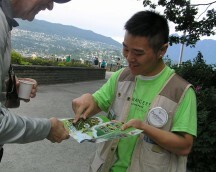 From July 3, 2012 and through the summer months, roving volunteer naturalists will share their infectious enthusiasm for Stanley Park’s wildlife and wild spaces with visitors to Vancouver’s world famous urban park. Stanley Park Ecology Society (SPES), an independent not-for-profit and leading Park Partner, is launching the 12th season of running its Eco Ranger program. SPES’ Eco Rangers are a group of volunteers from Canada and abroad, and in the summer months Eco Rangers work in pairs as roving naturalists in the park, answering visitors’ questions about local animals, plants and cultural history, and providing other important on-the-spot interpretation. They also focus on educating Park visitors on appropriate behaviour in the Park, such as not feeding wildlife. The volunteers are intently focused on interacting with visitors and encouraging harmonious co-existence with wildlife through education. Their roles do not include ensuring compliance with regulations and bylaws. Eco Rangers rove and operate interpretation stations in Stanley Park every Tuesday to Sunday from the beginning of July through to the Labour Day weekend in September. The Eco Ranger Program is funded by the Vancouver Board of Parks and Recreation and Direct Access Gaming.